Soak all dry fruits and poppy seeds together in 1/2 cup of water for 4 to 5 hours or overnight. Dry roast the peppercons, cinnamom stick, green cardamom and fennel seeds on low flame. Fry them till you get nice aroma. Combine the soaked dry fruits and roasted ingredients and grind them to smooth paste..
Place the saucepan with the milk into it on the medium flame. Bring the milk to boil and add grinded paste into it.Stir well. Let milk simmer for 5 minutes. Then add sugar and crushed saffron strands. Mix well.Cook for 2 minutes.Turn off the flame. Let it cool to the room temperature and refrigerate it for 4 to 5 hours. 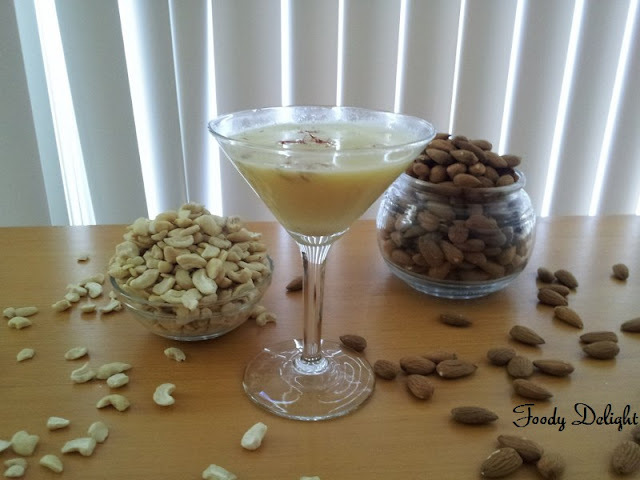 Serve chilled and garnish with chopped nuts if desire. Wow! That looks delicious Panjali!Thanks for visiting my blog :) Nice to meet you!